Big Red Barn, by Margaret Wise Brown, illustrated by Felicia Bond: This classic story was one of our favorites when Little M. was a baby. 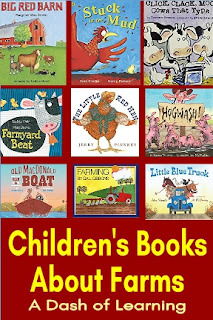 The rhyme and cadence of the words are so relaxing and the illustrations are beautiful. 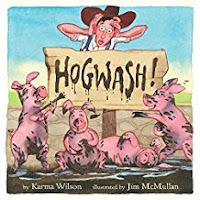 Hogwash, by Karma Wilson, illustrated by Jim McMullan: The farmer decides that it's about time that he cleans up all of the animals of the farm, but the pigs have other plans. They thwart his tricks, bribes, and schemes at every turn. Eventually, he comes to a surprising conclusion. 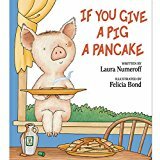 If You Give a Pig a Pancake, by Laura Numeroff, illustrated by Felicia Bond: Sequel to the classic children's book, If You Give a Mouse a Cookie, this book follows a very similar format. The satisfaction of every desire, spawns a new desire for the pig. 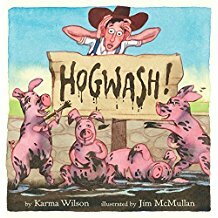 Eventually, the pig's desire comes full circle to the original pancake which bookends the story. 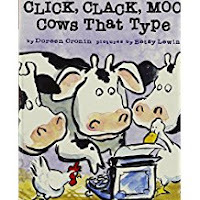 Click, Clack, Moo: Cows That Type, by Doreen Cronin, pictures by Betsy Lewin: What happens when the cows find a typewriter? Why, they engage in collective bargaining of course! Admittedly absurd, this story is also engaging and amusing. Sheep Go to Sleep, by Nancy Shaw, illustrated by Margot Apple: The whole flock is having trouble falling asleep! 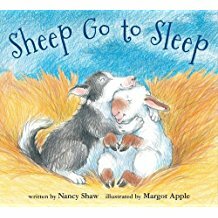 The sheep dog takes care of his friends one at a time giving them each the thing that they need to help them drift off to dreamland. 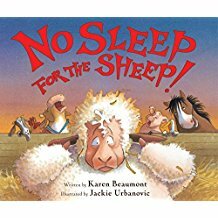 No Sleep for the Sheep! by Karen Beaumont, illustrated by Jackie Urbanovic: The sheep is trying to sleep, but all of the animals in the farm are making noise. She has to help each farm animal get to sleep, before she can sleep. 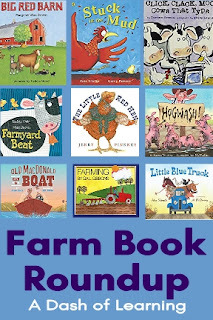 This book would be a great addition to a farm theme or just a nice bedtime book. The Little Red Hen, by Jerry Pinkney: In this classic story, a little red hen undertakes all of the steps needed to make a loaf of bread. 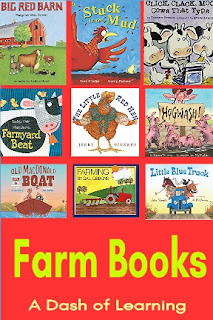 She invites all of the other farm animals to help her, but at each turn they decline. At the end she asks if anyone would want to share her bread. When they all rush to eat the bread she makes, she informs them that they will not being having any bread since they did not help her at any point. 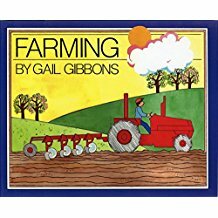 In addition to teaching this important moral lesson, the book is filled with beautiful illustrations. Rooster's Off to See the World, by Eric Carle: The rooster decides to go on an adventure to see the world. As he travels animals decide to join him. This cute counting book is a phenomenal choice for toddlers and preschoolers because of its accessable language and classic Carle illustrations. 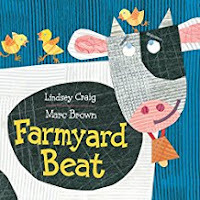 Farmyard Beat, by Lindsey Craig, illustrated by Marc Brown: This book has tremendous rhythm and begs to be sung or chanted. It will seriously get stuck in your head. My three year old was in giggles every time we read it. 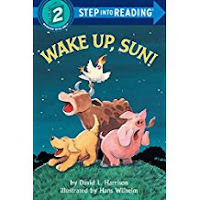 Wake Up Sun!, by David L. Harrison, illustrated by Hans Wilhelm: In this book, the animals on the farm wake up early before sunrise and try to discover the reason that the sun is "missing." 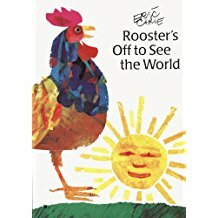 This book is excellent for giving children a model of skepticism (i.e. not believing the first hypothesis that you are presented such as that the sun is not up because it is sleeping). Old MacDonald Had a Boat, by Steve Goetz, illustrated by Eda Kaban: In this fun children's book the old MacDonald and his wife decide to build a boat! 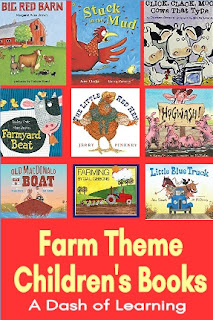 The text takes the form of the classic song, with a twist: instead of listing all of the animals on the farm it chronicles the steps taken to build the boat. It is definately a fun option for your bookshelf. Stuck in the Mud, by Jane Clarke, illustrated by Garry Parsons: When a chick gets stuck in the mud, every occupant of the farm also gets stuck trying to get her out. 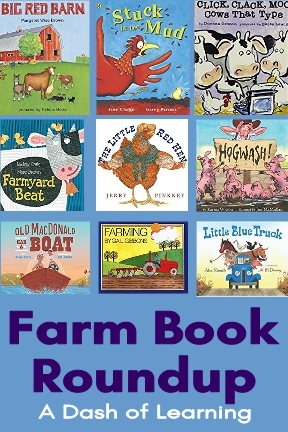 With a cute twist for an ending, this book is definitely a fun addition to your farm theme. 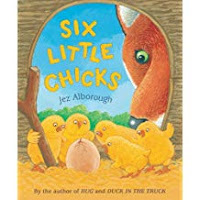 Six Little Chicks, by Jez Alborough: The hen is trying to keep her new chicks safe from the fox. 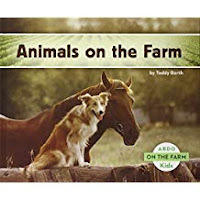 This amusing book also works as a counting book using ordinal numbers (first, second, third, ect) so I could see connecting it to very interesting math lessons. Farming, by Gail Gibbons: this is a great informational resource for any parent or teacher hoping to communicate the complex interesting reality of farming. Virtually every aspect of the industry is at least touched upon. 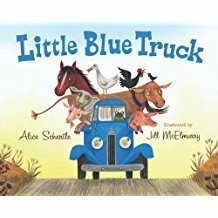 Little Blue Truck, by Alice Schertle, illustrated by Jill McElmurry: When a rude truck gets stuck, no one wants to help him accept the little blue truck. When the kind little blue truck gets stuck all of the animals of the farm rush to his aid. 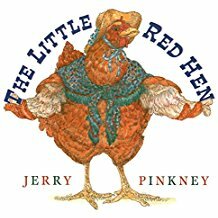 This adorable story was one of Little M.'s favorites when she was a baby. Animals on the Farm, by Teddy Borth: this is a cute nonfiction book about different farm animals. It's pages are full of crisp colorful photographs. 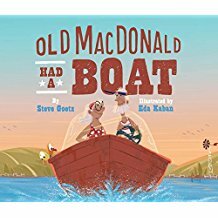 We "read" the ebook version that came with narration, which is always a welcome break for my voice! Sophie's Squash, by Zietlow Miller, illustrated by Anne Wilsdorf: This book was hands down my favorite on this list. 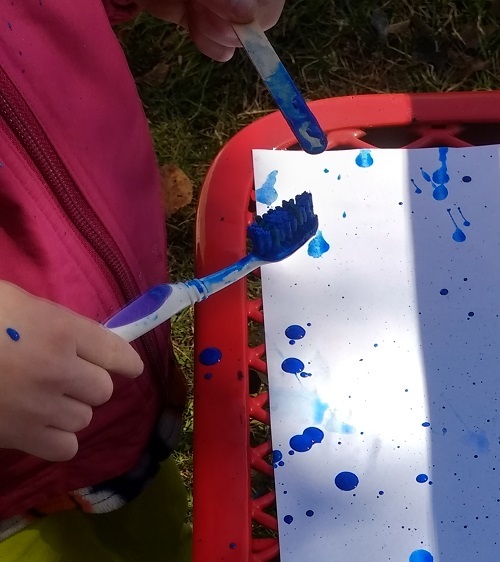 In it, a little girl decides that the butternut squash, which her parents intended for dinner, should instead be her favorite toy, and even her friend. She carries it with her from one place to another. Her parents try to convince her to give it up before it rots, but she refuses. Eventually the farmer at the farm stand gives her some advice to keep her squash healthy (he clearly thinks she is talking about a live plant) and she follows it, placing her squash outside in the dirt. Winter comes, and the squash becomes covered with snow. In the spring when the snow melts, Sophie discovers a surprise. 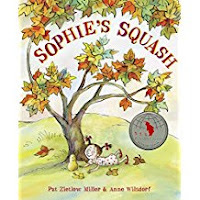 This book is not only charming and entertaining, but it is also a great connection to the life cycle of flowering plants such as squash. 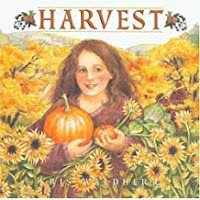 Harvest, by Kris Waldherr: This book is lovingly illustrated. It shows the story of a girl harvesting all of the different fruits and vegetables of her garden. 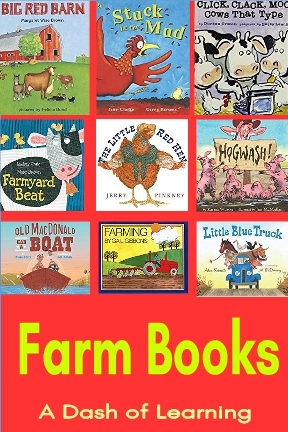 It shows some of the chores and planning that goes into creating your own food from scratch. Who Sank the Boat? 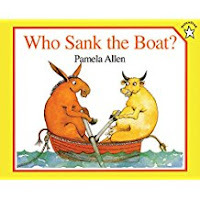 by Pamela Allen: This is a great book about the physics of weight and buoyancy! Various farm animals climb into a boat from largest to smallest. The animal you would least expect ends of sinking the boat. 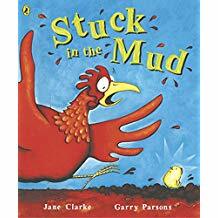 This book is a great way to begin talking about water displacement. 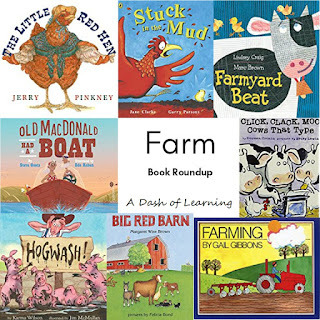 Also, be sure to check out our collection of farm activities available in my teachers pay teachers store. Thank you so much for stopping by and checking out all of the amazing farm books we've been reading this week. 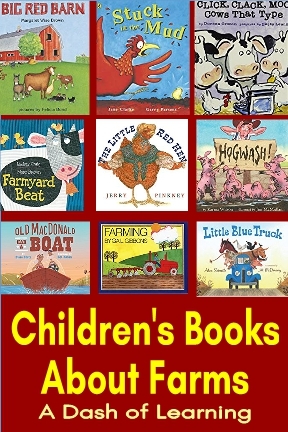 What great books did we miss? Let us know in the comments below! 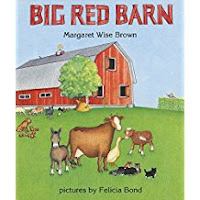 We really like Big Red Barn...haven't seen most of the others including the Eric Carle book. Will have to check out the library. 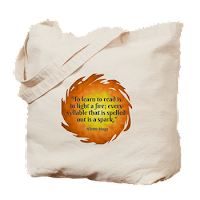 The writing work is remarkable, and I am so pleased that you were able to share this article here.I decided to add your blog to my bookmarks so I can return to it at a later date. 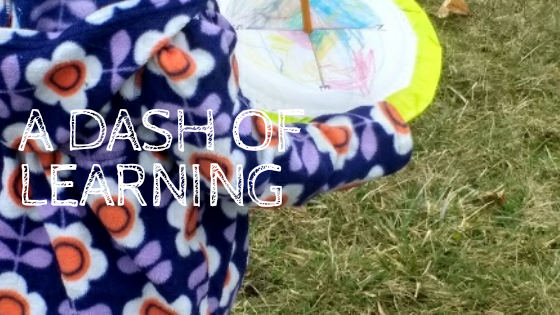 This website basically beautiful points and things right.This was a wonderful site and I really enjoy it the data you shared.Cheers for sharing with us your wonderful blog.